As far back as I can remember, when the summer months approached, my mom was ALWAYS looking at flowers and buying them. Her huge yard has never been anything short of amazing, especially the back. We had a huge garden growing up and flowers upon flowers. I remember dragging my feet because WHO wants to go look at flowers? And then the weeding. What kid likes weeding? I never understood how my mom could spend hours outside weeding. Then yesterday came. I have one nice sized flower bed outside my home. It's the only thing that I have to work with, and yesterday I thought about how sad it looked with the few bushes and overgrown weeds. So I did what any newbie would do, I consulted someone who knows it all....my mom. 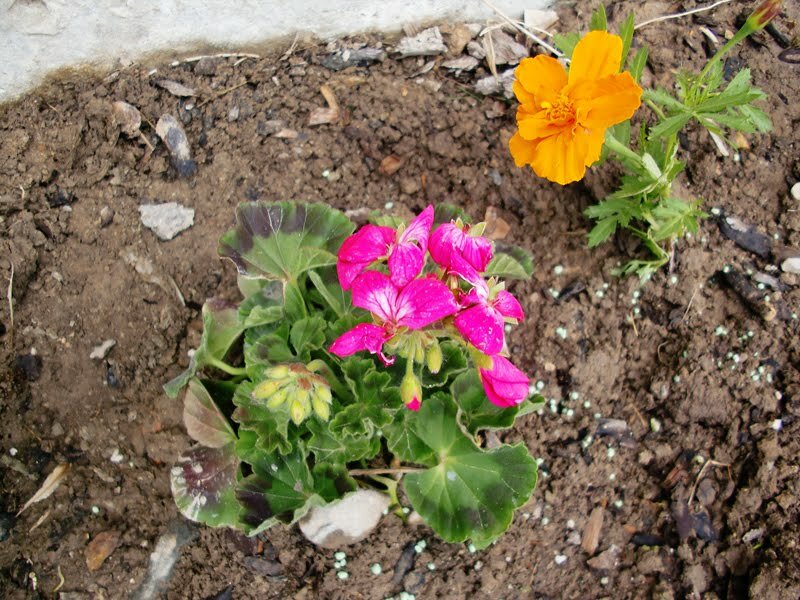 I ended up getting orange marigolds, pink geraniums, and magenta and white petunias. It gets addicting. Just wait until you start digging up sod/lawn so you can plant more flowers. Put some compost around your flowers and fertilize them on a regular basis as well as make sure they get watered, and they will do great! Nice!! I bet it's going to look beautiful. We don't have a very big flower bed but it's fun to try to make it look nice. We bought a tree a couple weeks back for our yard and I was so excited...who would've thought I would get excited about a tree? Not me! I am my mother after all. Great job. There is just something theraputic about seeing things grow. There is something therapeautic about working in the dirt & seeing the beautiful outcome. Awww, I can't wait to see it! There certainly is something relaxing about working out in the yard.